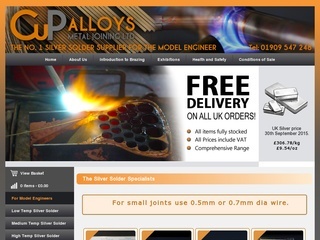 CuP Alloys the specialist in the field of silver soldering and brazing. Whatever you metal joining requirements are CuP Alloys have the solder to suit in the form and quantities you require. Silver content 0-56 % rods 1.0 to 2.5dia. Wires 0.5 1.0mm pastes, rings, foil. It is all there. Every pack is clearly labelled and certificated. Sound technical advice is readily available to ensure you produce sound strong leak-free joints.